Last year at this time we were eagerly waiting for our new arrival. How quickly has this year flown by! Parents has gone back and we are trying to get into a new routine. It hasn't helped that the little one has been unwell. Cold, cough and ear infection... do you have any home remedies that have worked for you? I would love to hear about them. 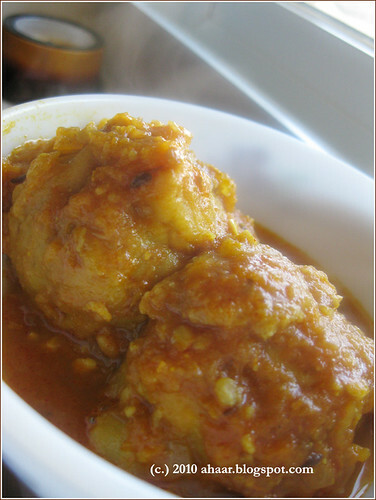 So coming back to today's recipe, I craved it immensely when I was pregnant. The craving would come strong and suddenly, and I would go looking for some shrimps for shorshe chingri. When I said this to my mom when she was here, she of course made a spicy, hot batch immediately. Clean and devein the shrimps. Add salt and turmeric powder and keep it aside. 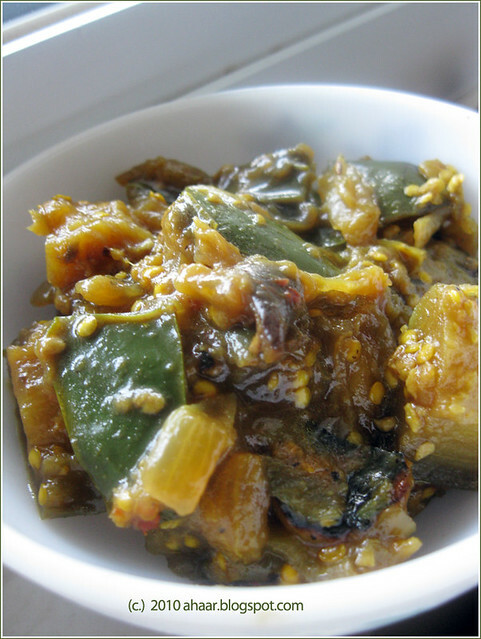 In the meantime, make a paste with 1 green chilli (more if you like it spicier), mustard seeds, poppy seeds and garlic clove. Heat oil in a pan and lightly saute the shrimps. 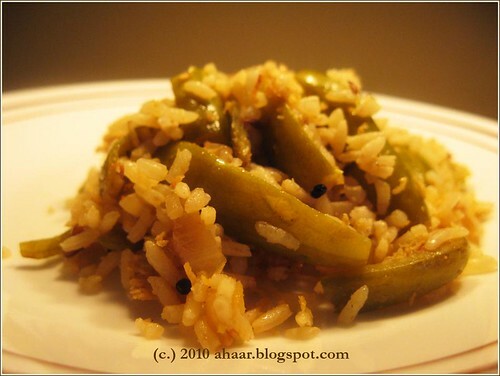 Take them out and in the same oil, add the kalo jeera, green chilli. After a couple of minutes add the mustard-poppy seed paste, turmeric powder and salt. Let it cook for a few minutes and then add the shrimps. Let it cook for another 2-3 minutes on low heat. 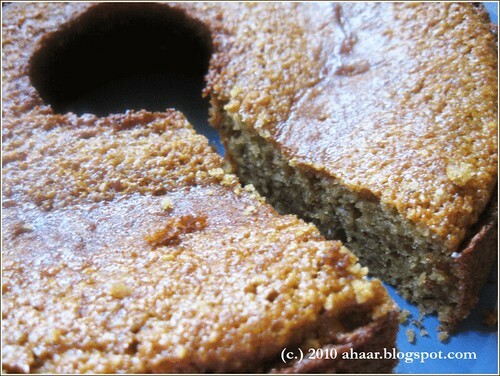 Every year around this time I am looking for a new cake recipe for Aswin's birthday. 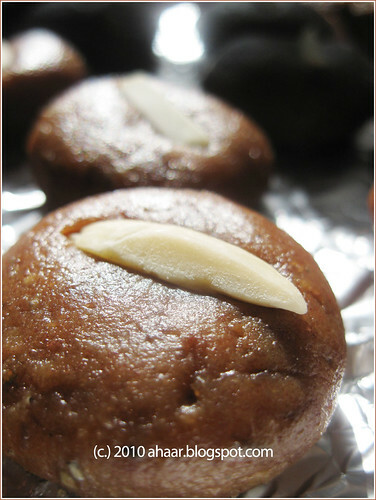 This time I came across this recipe which doesn't use any sugar or butter. I was intrigued and decided to try it out. I was not going to do this post because I thought the cake had not turned out exactly as I expected it. But everyone who tasted it said it was unique and delicious. So even though it didn't rise as much as I had expected, the flavor shone through. So here I am writing about it. I took the recipe from Cookthink and then tweaked it to our taste. 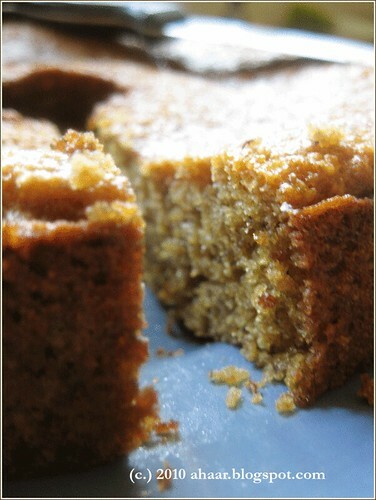 I used whole wheat, omitted out the cinnamon and used fresh ginger which gave it a spiciness. I also made a syrup of fresh lemon juice, honey and powdered sugar which I added on top. Preheat the oven to 350F, grease an 8-inch cake pan generously with oil spray, and set aside. In a medium bowl, whisk flour, baking powder, salt, ginger and zest together to blend. In a separate bowl, whisk the eggs a large bowl, then add the oil and mix it together. Then add the honey until well-blended. Next add the warm milk to the egg mixture in a slow, steady stream. Add vanilla and and whisk again. Add the flour slowly to the mix, stirring constantly till everything is mixed well. The batter was quite runny. 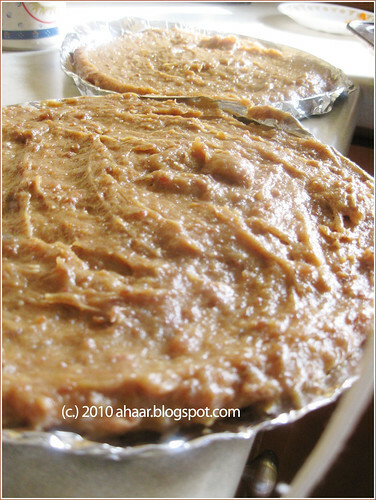 Pour the batter into the pan and bake for 35-45 minutes. Keep checking though as mine was done in 38 minutes. Transfer it to a plate. For making the glaze, mix all the ingredients together, warm it and then pour it over the cake. 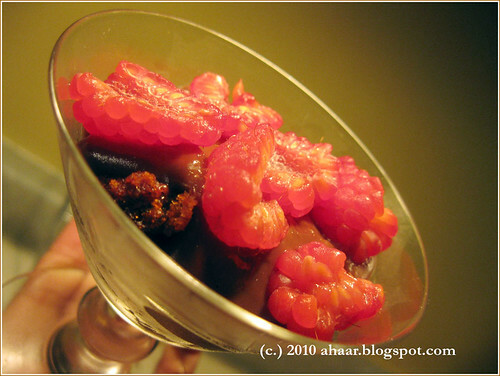 For the dinner, I served it with some chocolate pudding and fresh raspberries. 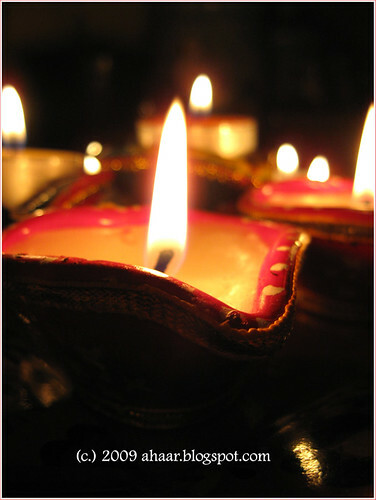 Happy Diwali dear family, friends, bloggers and readers. We've entered the winter season, and I know it from the cold, ear infection, cold, cough and many more rounds of the same in our family. The other way I know is I am starting to crave more fried food, and especially if it is a fresh fish, nothing makes me happier. We found butterfish at Monahan's (we have found great variety and wonderfully fresh fish here) and picked up a few not knowing what I was going to do with it. 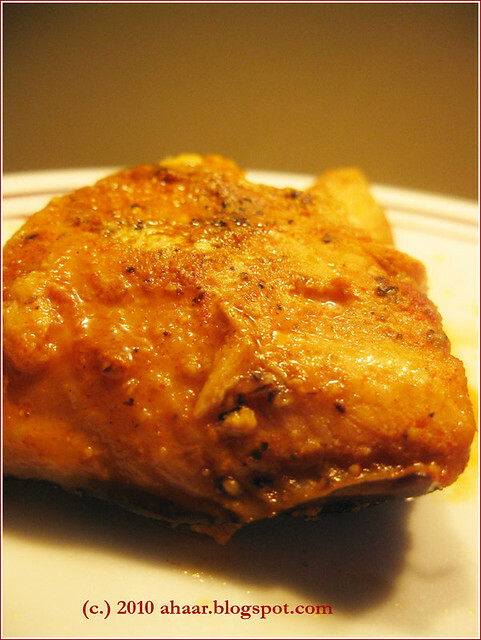 I ended up frying it a couple of times with different marinades. Don't ask me to choose one cause I won't be able to. 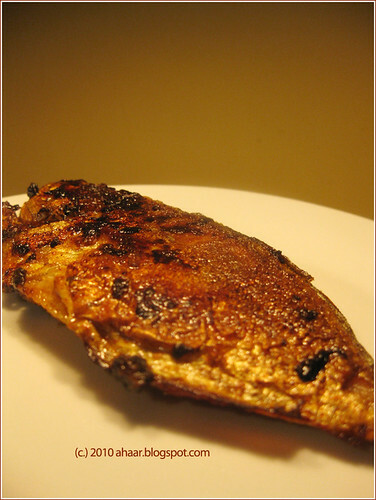 Each one gave it a distinctive taste and nothing spells comfort like a fried fish on a rainy day. After letting the fish marinade for 1-2 hours, heat oil in a shallow nonstick pan and fry the fish 4-5 min on each side or till done. 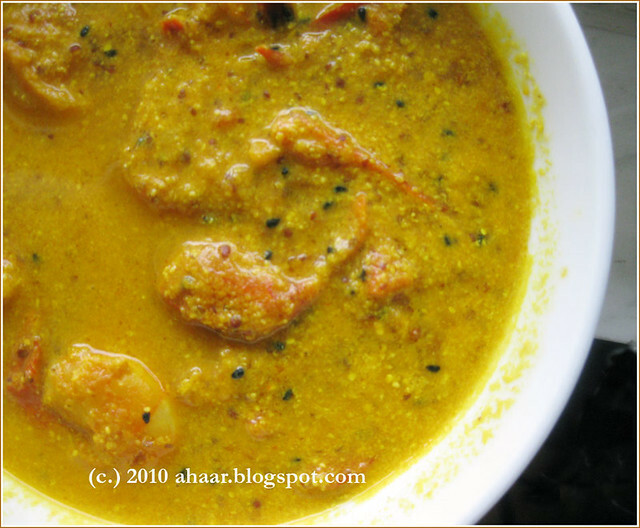 Serve warm either as a starter or with garam garam dal bhaath! It's Durga Pujo season! And it's also Ameya's first pujo. So as I was getting everything ready to take for the pujo, I decided to make sweets at home rather than buying from the Indian store. 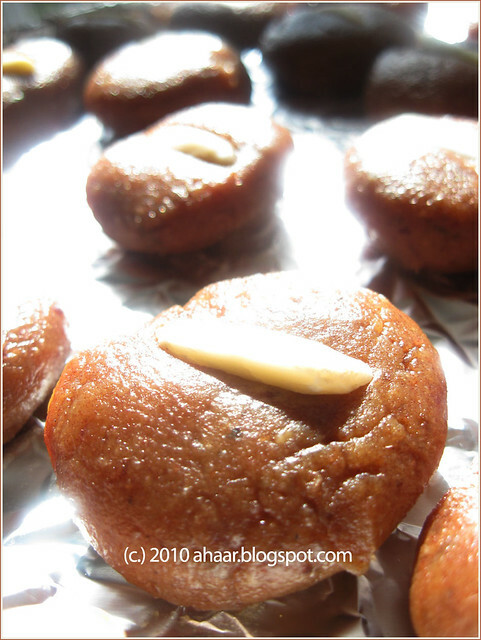 I wanted to make Indian sweets using dates and came across this recipe at Red Chillies. I tweaked it a little bit to make date and almond peda. I had help from my mom as we were trying this recipe. 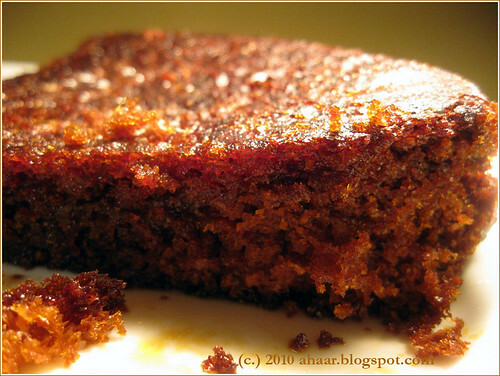 Chop dates and cook it with 1/2 cup milk on low heat till it all melts together. Cool it and grind it in a mixer. Heat a pan and melt the ghee. Then add the date mix and condensed milk. Then add the almond powder and cook it on low heat till the mix comes together and leaves the sides. Cool it and then make small balls, flatten them and put a almond sliver in the middle. You can cool it for a few hours in the fridge and the serve. 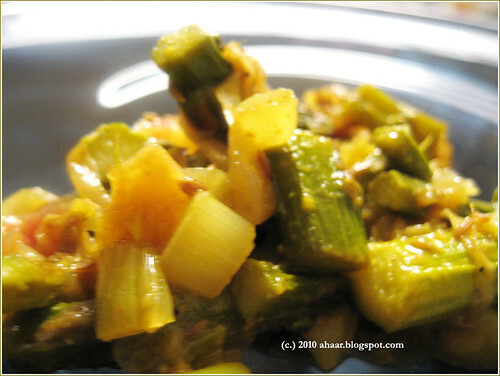 Sometimes, we are so comfortable using a vegetable in a particular way that it takes time to think of making different sabzi/bhaji/tarkari with it. Such is the case with eggplant and me. We enjoy our bharta, begun bhaja/beguni so much that we continue to make it regularly. So when my mom suggested making alu beguner tarkari (eggplant and potato sabzi), I was in two minds. I was excited to try a new combination. On the other hand, I was happy with my eggplant variations. 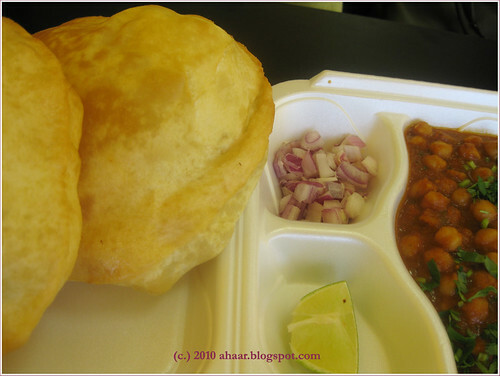 When the tarkari was done and I took the first bite, my first reaction was a sigh! It was so delicious, and so different from my regular creations that I took multiple helpings till my taste buds were satisfied. And of course, we've made it several times since. 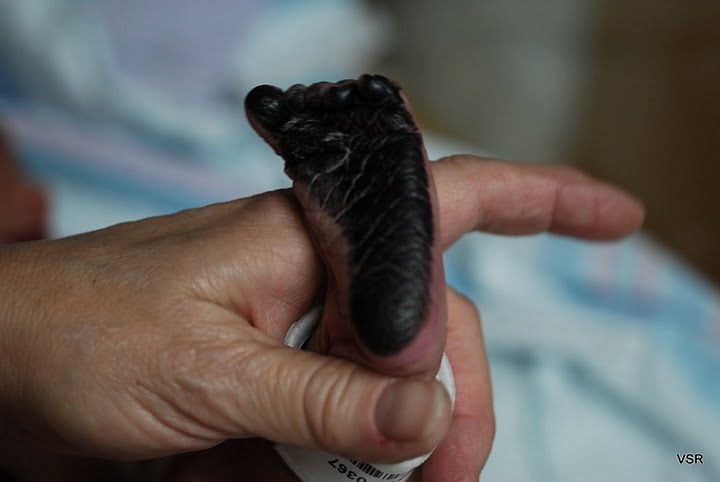 As I write this, my mom adds that it turns out even better if you choose a fresh eggplant. We have been getting some fresh ones from the Farmer's Market and they melt in the tarkari. Heat oil and temper with cumin seeds. Then add the potato cubes and saute for 3-4 minutes. 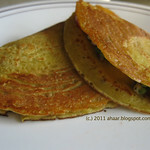 Once they are done on one side, add the onions and turmeric powder and turn to the other side. Then add garlic paste. Stir for a couple of minutes. Then add in the ginger, and green chillies. Add the eggplant and let it all cook together. Pour in 1/4 cup water, salt and let it cook on medium heat with closed lid. 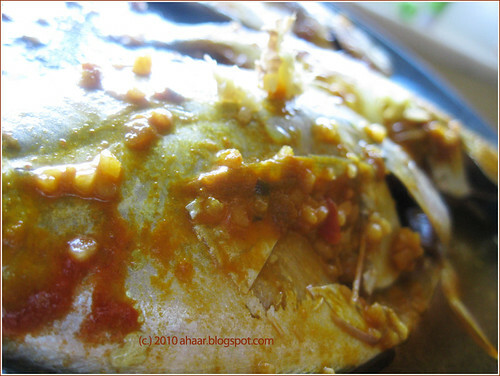 When the tarkari is almost done, add in the pureed tomato and cook for another 1-2 minutes. Then take it off the heat and add in the cilantro and let it sit for 4-5 minutes. Stir and serve warm with rotis. I made this recipe a while back, forgot about it and then tried it again recently. Even though it says 3 pepper, it's not super spicy. I guess as we move towards winter, with grey skies, I am beginning to crave more spicy food. With black pepper, chilli powder, and ancho pepper, garlic and olive oil, this gave a nice kick to the smooth salmon. 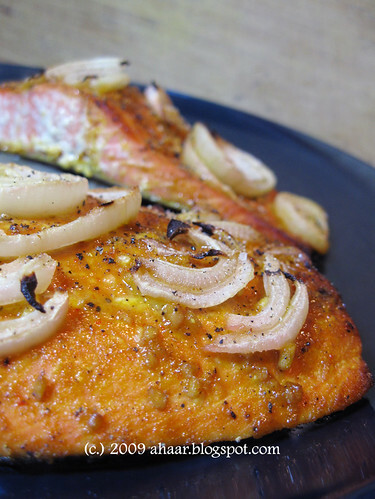 We frequently bake salmon, and this recipe is easy, healthy and filling. 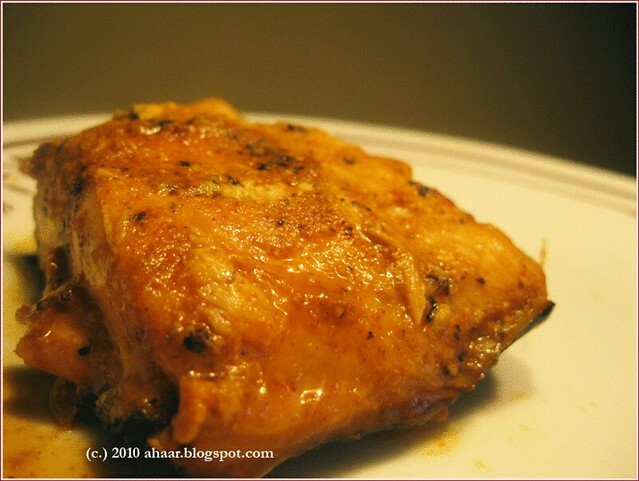 I am always trying out new marinades and this was one of the trial recipes which clicked. 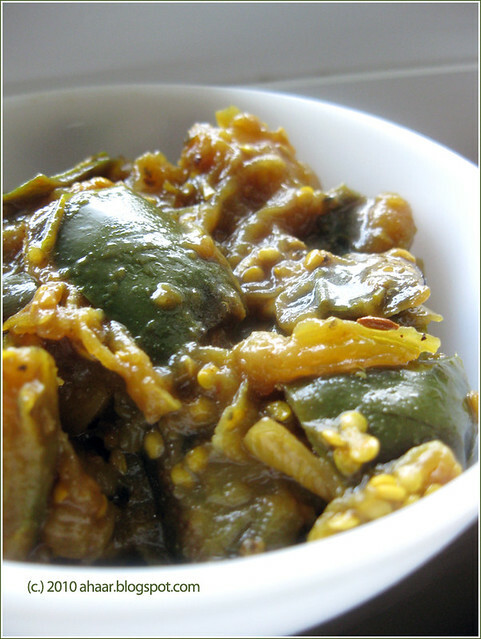 This goes especially well with salad or even simple dal and rice. Mix all the ingredients and lather the salmon fillets with the marinade. Set it aside for 30-45 minutes. Preheat the oven to 325 deg F and cook the salmon for 15-20 minutes till it's completely cooked. This is an Indonesian recipes I made from Madhur Jaffrey's cookbook Step by Step Cooking a few weeks ago. It was interesting to see the similar ingredients used in a slightly different way. 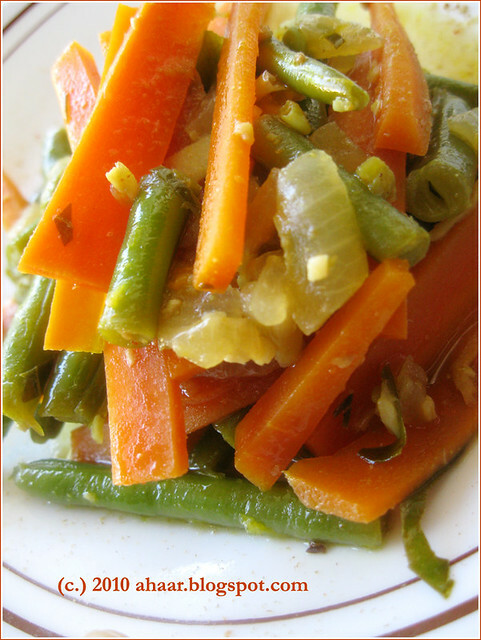 For instance, if I had made this earlier, I wouldn't have put garlic and curry leaves together with beans and carrots. But we all liked how it turned out. Since then, we have made it a few times and liked the results every time. Chop everything into thin slices. In a pan, when the oil is hot, put in chillies, ginger, garlic, curry leaves, and onion. 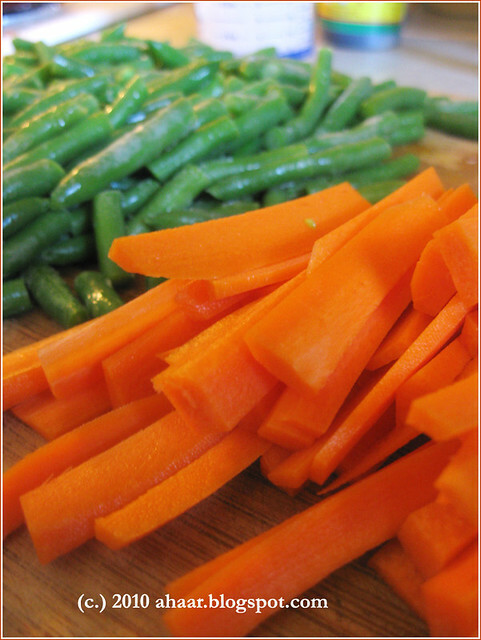 Then add green beans, carrots and salt. Saute it all together for a couple of minutes. Then add about 3/4 cup water and let it cook for 5-7 minutes till the carrots turn soft and the water disappears. When I come back home after work, it's hard to cook for the night from scratch. That's because I want to feed the little one, spend time with him, take him out for a walk etc. So it helps if things are half done and that's one of the reasons I like this recipe so much. Not to mention that it is a healthy side with either chapati or rice. I can get the sprouted moong ready the night before. Then it's quick to make this delicious and easy recipe. Wash and clean the sprouted moong. Heat the oil in a pan and temper it with cumin seeds and green chillies. Then add the ginger, onion and saute for a few minutes till the onions turn soft, but not brown. Then add the tomatoes and let it cook till the tomatoes turn soft. Add the sprouted moong, cumin powder, turmeric powder, and salt. Add about 1/4 -water and let it cook till moong is cooked. It shouldn't turn mushy though. Add more water if needed. Garnish with chopped cilantro and serve with a wedge of lemon. This is the story of three over ripe bananas. Sitting in the hot kitchen they debated if they will be used in a milkshake or with yogurt or as baby food. They didn't know that the chef had completely different plan for them. The little one just turned six months and to celebrate the first half birthday, I used the bananas to make banana and almond flour cake. I looked around for recipes and found a good one at Elena's Pantry. I tweaked it a bit for my taste and convenience and made it over a weekend afternoon. I must say it felt good to be baking again after a long hiatus. It helped that the cake turned out great too! Preheat the oven to 350 deg F. In the meantime in a large bowl, mix together almond flour, flour, salt and baking soda. Then combine sugar, oil, eggs and vanilla extract. Then stir in the mashed bananas. Mix wet ingredients into dry ingredients, stirring constantly. Prepare a cake pan and pour in the cake batter. Bake for 40 minutes or till the toothpick comes out clean. On another note, Ameya has started eating solid food and I am always thinking of new combinations and starter foods for babies. What worked for your little one? It was one of those perfect days, the sun was neither too hot, nor too timid. I had just managed to to find enough time to put the pickle I put every year (thanks again Manisha!) and I still had time. The little one was taking one of those rare long afternoon naps! We were getting food ready for dinner. 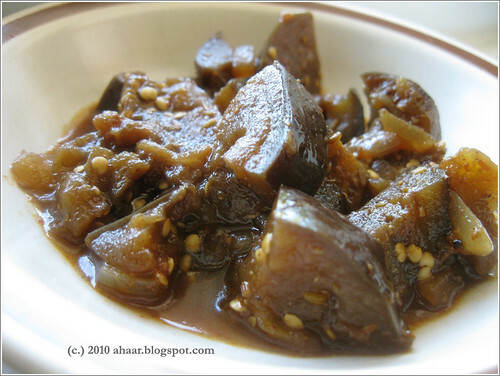 I had a eggplant and was wondering what to do with it when Aswin brought out one of our Madhur Jaffery recipe books. It dawned on me that I had not used one of those in a few months. So I looked up and found a Malaysian recipe - Pacheri Terong - that sounded fantastic. We had all the ingredients, I adjusted it to match our tastes and started cooking. I have to say it came out delicious. I could taste all three - hot, sweet and sour - in perfect balance with each other. 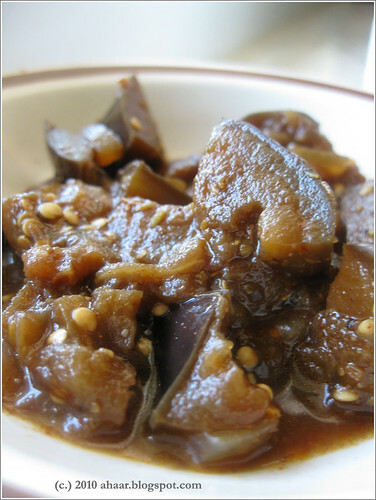 And the cinnamon in eggplant, I had not used it before, gave it a wonderful aroma as well. Grind cumin, coriander, red chillies, cloves, and cinnamon to a fine powder. Heat oil and then add onions and ginger. Saute it for a few minutes till the onions become soft and translucent. Then add the powdered spices. After this, add water and turn down the heat and let it cook together for a couple of minutes. Then add paprika, tamarind, sugar and salt. 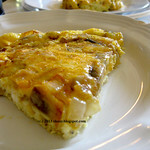 Put in eggplant, and cook for 20-30 minutes until eggplant is tender and the sauce is thick and sticks to the eggplant. We has a couple of mangoes at home which were ripe, but not completely, so they were tart and firm. No one was interested in eating it when sweeter ones were available. 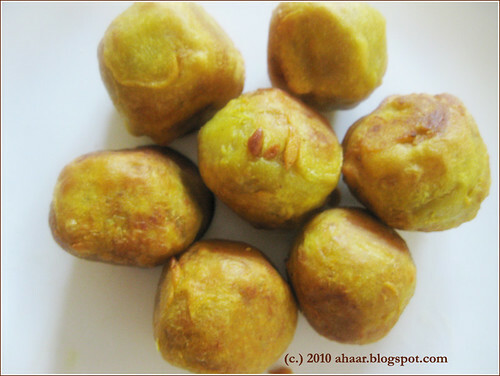 So when my MIL was visiting, she took the two mangoes and made Mango gojju. This is a completely new recipe for me. 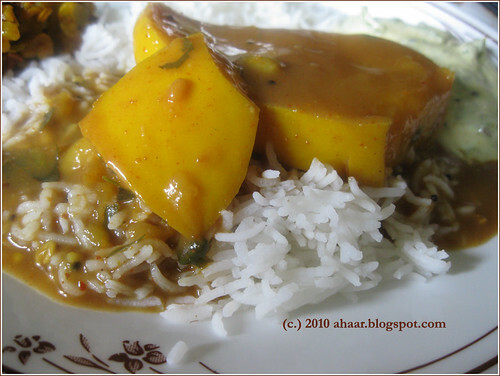 I had used ripe mango in Thai recipe before, but never tried it with Indian spices. It was the perfect use of the mango. It was so delicious, perfect mix of fiery spices balanced with sour and sweet. We finished it the same day. 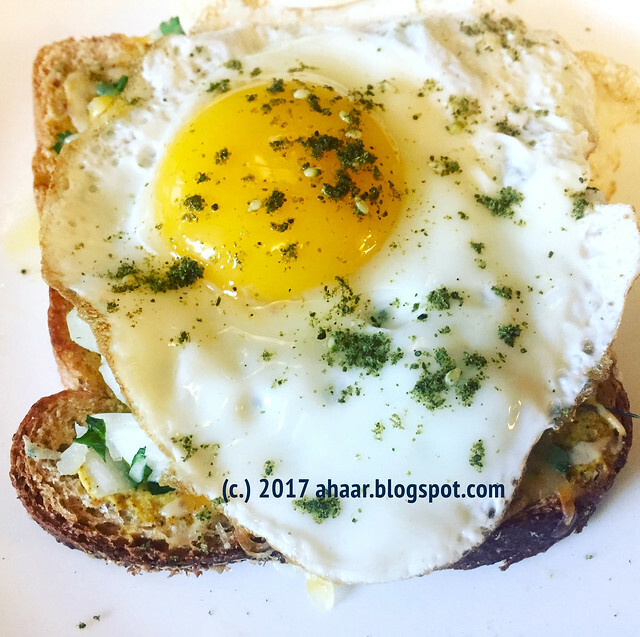 Recently Aswin made it for a brunch and again it was over in no time. 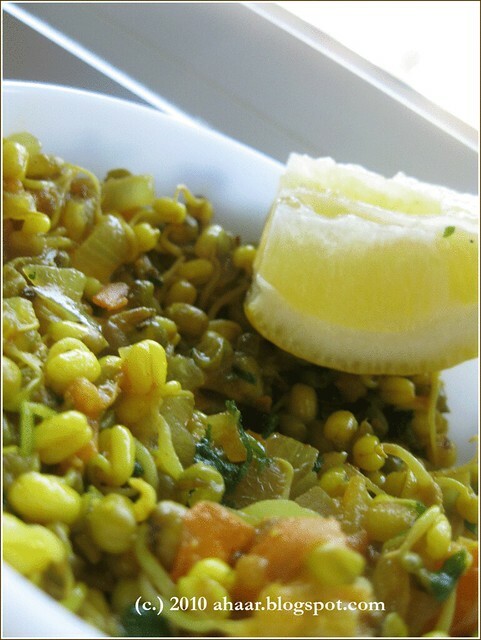 Saute urad dal, chana dal, coriander seeds, fenugreek seeds in 1 tspoon oil and then grind to a smooth paste. Cut Mango into small pieces . Add about 1 1/2 cups water or more if needed and bring it to a boil. Then add the paste, tamarind, Turmeric, jaggery and sambar powder. Let it simmer on low heat for 3-5 minutes. 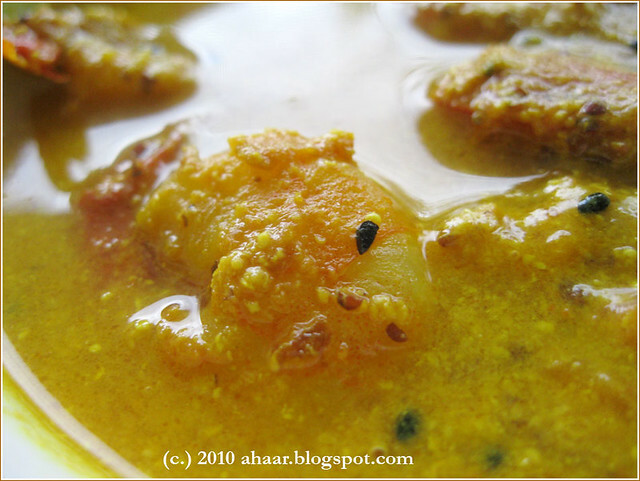 In a separate vessel, temper the rest of the oil with mustard seeds, dry red chillies, asafoetida and curry leaves. Add it to the Gojju. Add salt as needed. 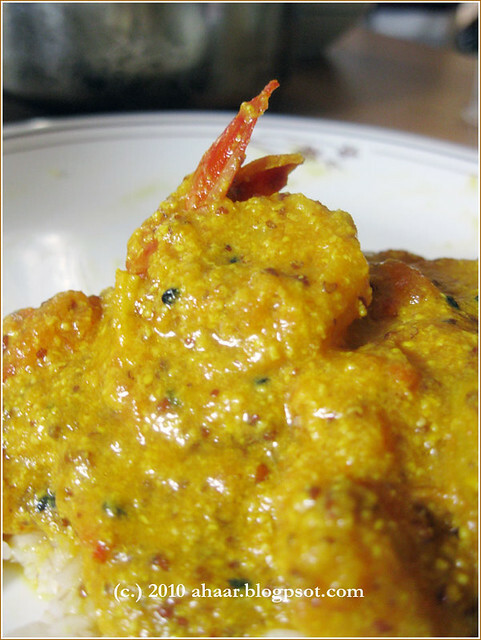 If you feel that the gojju is very thin, you can add either chickpea flour or rice flour to thicken it up. We didn't use it. Garnish with cilantro and serve warm. Recently I met a school friend, who was visiting Ann Arbor, after 19 years. There I've dated myself! It was nice, talking about school and other friends, not to mention sitting out in the sun, enjoying delicious food from Seva, as music filtered through from a neighboring concert. 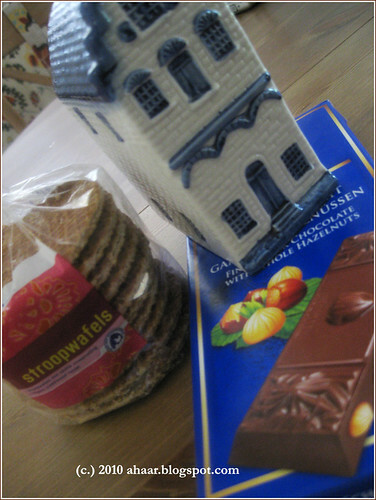 She got us goodies from Holland which we've been enjoying. But I've saved some for the World Cup finals. Can I enjoy the chocolate and still support Spain? It's wonderful to have parents over. I remember when Ameya was about 2 1/2 - 3 months, there was a period of 10 days when neither set of parents were around. I think we ate out for half of the days. Now it's back to delicious home-cooked food even when we have no time to cook. 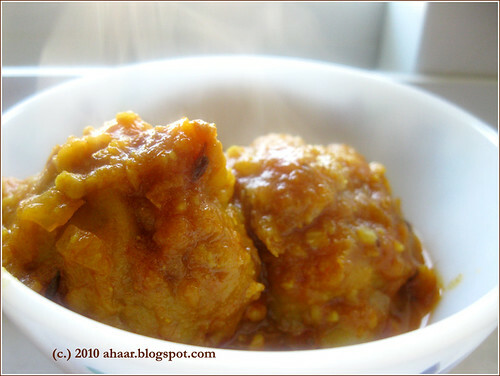 Last week, Aswin got plantains; my parents made plantain and potato kofta curry. When I told them I don't have the recipe on the blog, they volunteered to take pictures and write the recipe. I am only reproducing their work here. Now to the anniversary part: Ahaar is four-years old. This baby is so much older and wiser than the 5-month old. It hasn't complained that I haven't paid much attention to it recently, but greets me as enthusiastically when I see it occasionally. So happy four dear Ahaar! I hope to see you much more frequently as I learn to manage my time all over again. 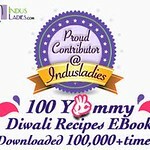 And thank you dear friends, and fellow bloggers for dropping by and your insightful and encouraging comments. Boil plantain and potato. 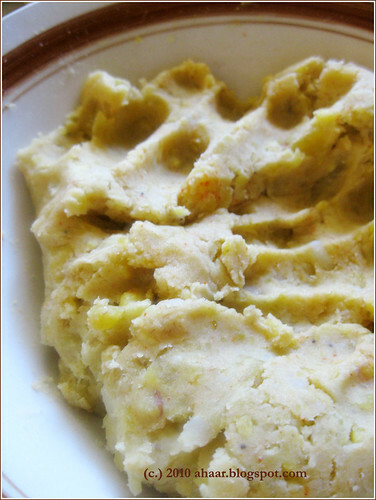 Take out the skin of plantain and potato and mash it. Add salt to taste and 1/2 tspoon chilli powder and mix it well. Make small round balls of the mix. Now, add water to the chickpea flour to make a thick paste.Dip the round pieces in chickpea flour paste and then fry them. We shallow fried them. Take the onion tomato, green chile, ginger and garlic and grind them to a smooth paste. Now heat the rest of the oil in a deep pan and temper it with asafoetida. Then add the red chile, and cumin seeds. After a minute, add the onion, tomato paste. Saute for a couple of minutes. Then add cumin powder and coriander powder and saute for another 2-3 minutes till the oil seperates from the paste. Add the rest of the water and bring it to a boil in medium heat. Once the water starts boiling, add the fried koftas into the curry. Let it cook on low heat for 4-5 minutes and then take it off the heat. As the curry cooks, the plantain and potato koftas will soak some of the curry. 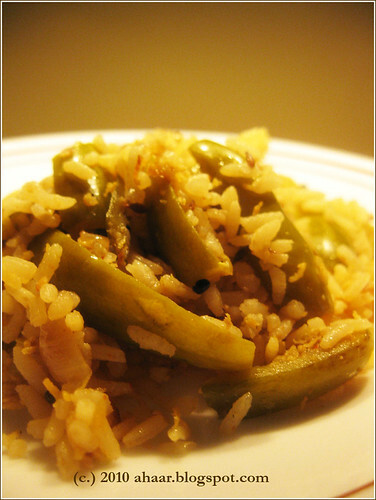 Serve warm with rice, or naan. Now that the Farmer's Market has started, we took our little one for Saturday visits. He likes the trips, looking at the vendors and their offering just like other little ones who are out with their parents. I bought several tomato and pepper plants. Then, I saw fresh asparagus and green onions, spinach, and other green veggies. I picked a bunch of veggies and for lunch, made some quick stir fry with asparagus and onions. 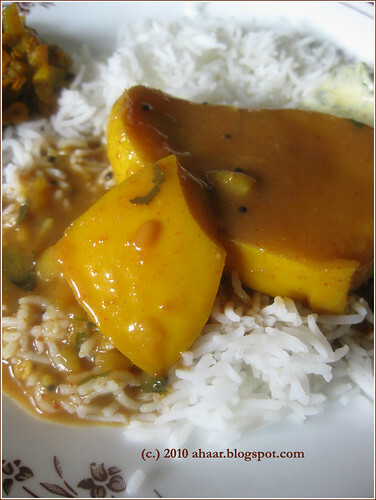 It turned out to be a great combination and went well with dal makhani and brown rice. Chop the asparagus and onions. Then heat oil and temper it with cumin seeds and dry red chillies. 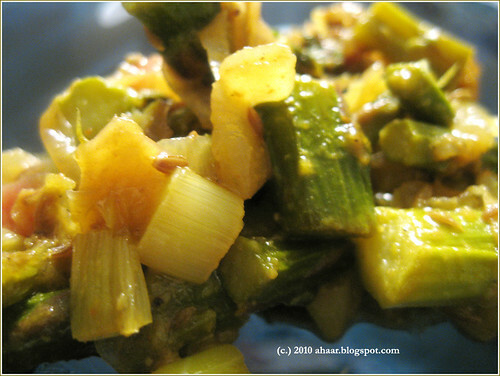 Then add the asparagus, onions, spices, salt and stir-fry it for 7-10 minutes till its cooked. You may add few tspoons of water if needed for the vegetables. Once cooked, sprinkle the lemon juice an serve warm. It was lite with a nice coconut and onion flavor. 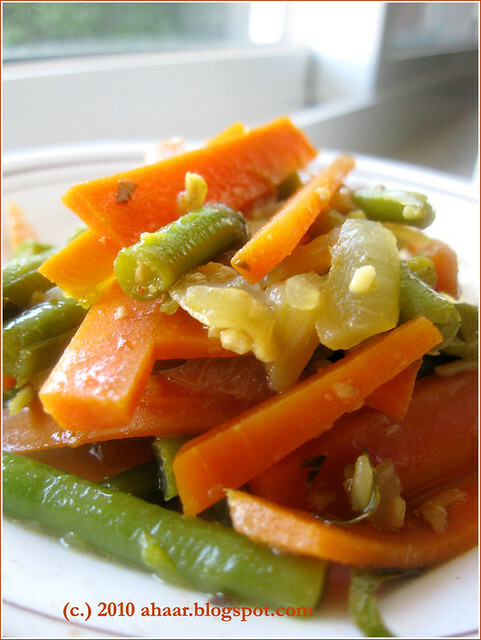 You can probably substitute kovakkai with any other firm green vegetable and it would still taste good. 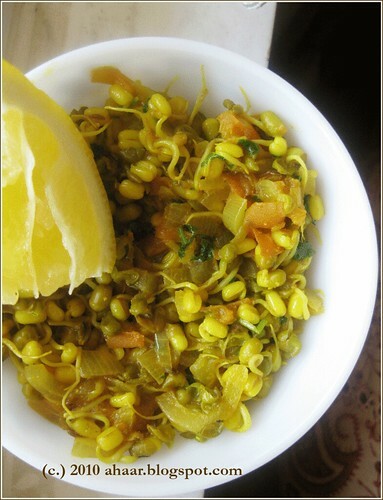 Heat Oil in a wok and temper it with mustard seeds, and urad dal. Then add turmeric powder, chopped onion and kovakkai and saute for 6-7 minutes till the onion is translucent. Then, if needed add some drops of water and let the kovakkai cook through. Then add chilli powder, salt, curry leaves and lime juice. Mix in the rice till rice is fluffy and mixed well with the spices. Serve warm. This taste delicious with a light raita and side of chips. I am not a big restaurant critic, in fact I try to stay away from it most of the time. But I couldn't stay away from recommending this one. 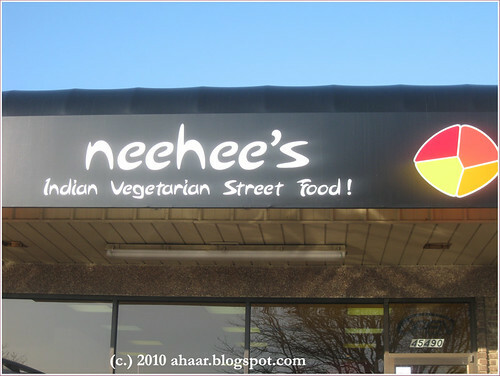 We found out about NeeHee's accidentally when a friend mentioned that she's seen a new Indian restaurant in Canton, Michigan - about 20 min drive from Ann Arbor. "It's a chaat place," she said and that got my attention. 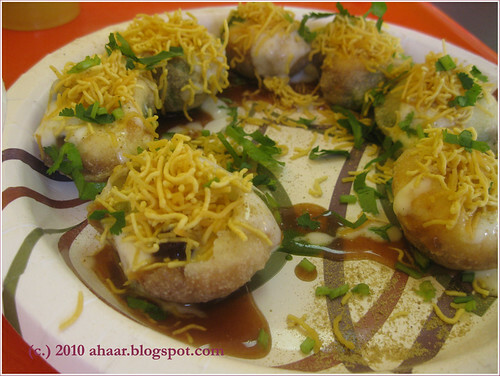 I've not found many good chaat places in the US so far, so I was curious to try this one. I was surprised to see that not only do they offer an extensive chat menu - bhelpuri, chole bhature, dahi puri etc, they also had dosas, and indo-chinese. Most of the time it's a recipe for disaster! Not this one. 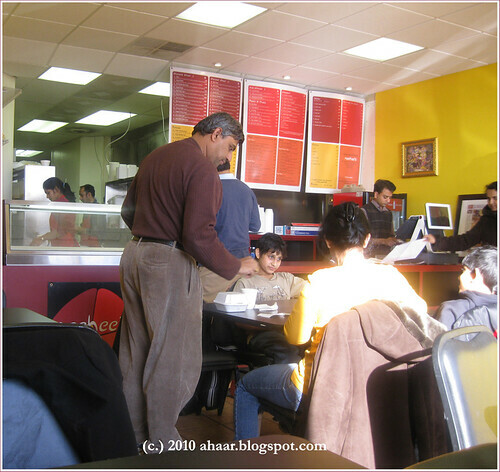 To describe the place, it's in a strip mall, next to an Indian store. The decor is quite bare, the utensils are all plastic, so if you were there for the first time, like we were, you would wonder if you had made the right decision to go there. I would say, eat fearlessly :) Not only they have different cuisines on their menu, they do it well too. 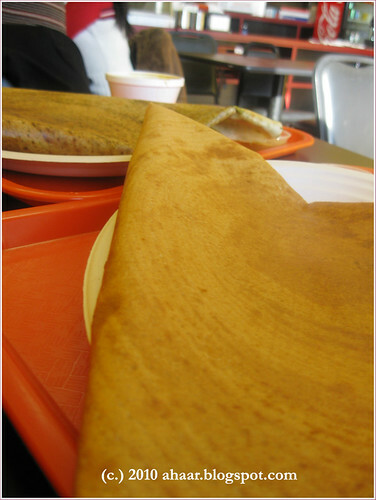 We've been there several items and sampled chaat, dosas, uttampams, and even some Indo-chinese. Everything we've eaten so far has been good. I would even say that it's probably one of the best Indian places for me overall. Here are some of the items that we tried the time I took the camera. The bature were soft and fluffy, reminded me of homemade ones, not the greasy street kind I've eaten before. The chole just the right kind of spicy and tangy. And for $5.99 it's a steal. The sugarcane juice is delicious, sweet, with hint of lemon and pudina. It went perfectly with all the spicy, street food that we ordered. 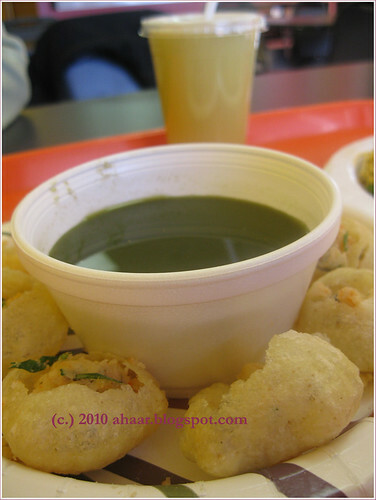 Overall, it's great addition to the Indian cuisine scene. It's affordable, delicious and quick. The last couple of weeks have seen a lot of transitions in the family. I am getting back to work and it's full of mixed feelings. And from what I've heard from my friends it lasts a while and there isn't any easy way out. In the middle of all the work, home, baby duties, food blog has taken a backseat. Here's what happened. I missed hosting Meeta's Monthly Mingle in all this. I had asked her to host this event many months ago. The deadline came and went, and in my busy days I checked my e-mail a little too late. I felt terrible, even thought about going on hiatus for a while. Sorry about this Meeta! Then I heard from friends (long lost ones) that they're enjoying my blog and it encourages me to come back again. 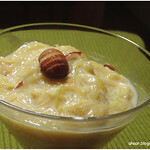 So in the guilt-ridden times, I give you guiltfree payesh. 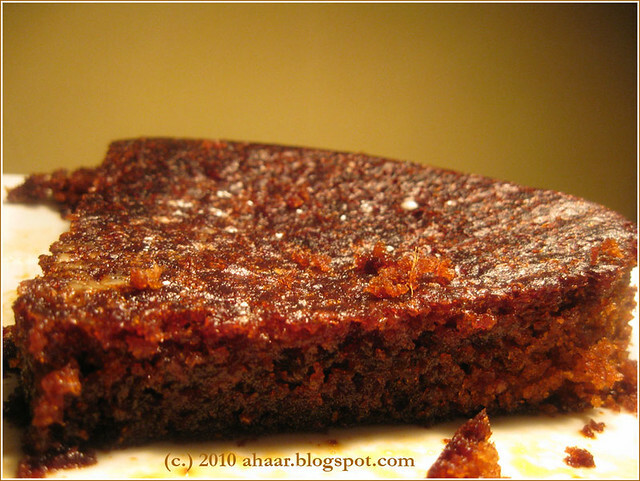 It's cooked with zero-fat milk, and was cooked on a weekend (the pictures is from diwali though). It always turns out good and soothes those tensions with one sweet bite. I make it the way my mother made it, letting 2-3 cups of milk simmer on low heat for a couple of hours, while stirring constantly. Once the milk comes to a boil, add the rice and let it cook in low heat. Add 1-2 cups of milk once the rice soaks it up and let it cook till the rice is boiled and it has a nice thick consistency. Add the sugar now and cook for another 5-10 minutes. 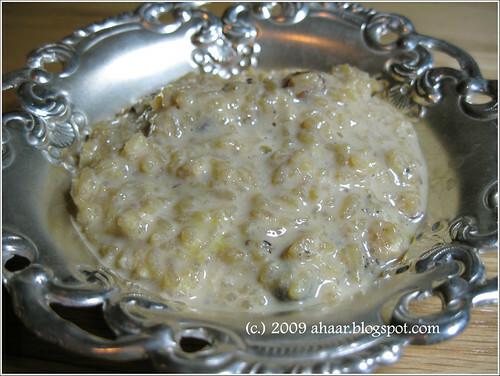 Put the cardamom, raisins, and almonds and cook for 5-10 minutes till everything has mixed in together. Time sure flies. Feels like just yesterday when I posted about the break. Ameya is turning two months tomorrow. He is smiling, cooing and beginning to move his hands around (not very coordinated yet!). Slowly but surely we are getting into a routine as we figure out schedules, time to cook, eat, and catch zzzs. While we are enjoying delicious home-cooked meals, thanks to my MIL, I am constantly looking for quick fix recipes that I can make as well. I stumbled upon this just by going through the jars sitting in the refrigerator. The flavor and sweetness of honey when combined with the sharpness of wasabi brought out a unique taste of the salmon. I cut thin slices of onions and baked the fish with it on top, broiling it for the last 2 minutes for the nice brown look. The salmon turned out great. 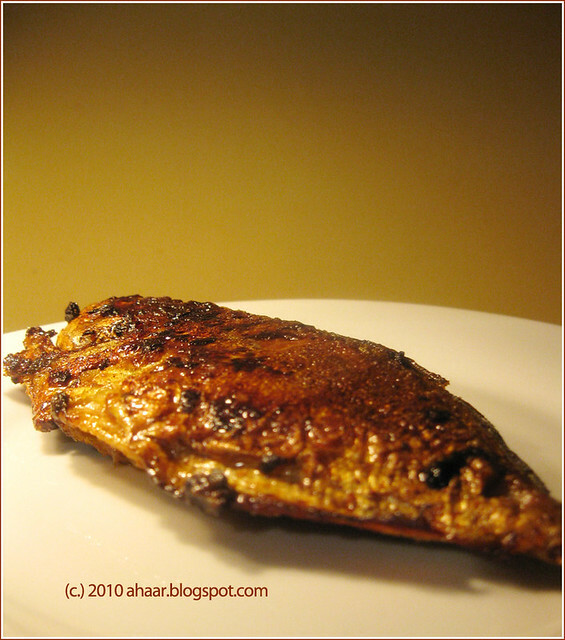 Preheat the oven to 350 deg C. Mix all the ingredients in a bowl and marinate the fish for 30-40 minutes. 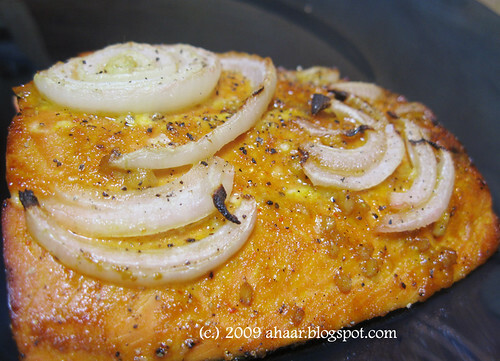 Place the onion slices on top of the fillets and cook the fish for about 18-20 minutes and then cook it on broil for a minute or so. We are so excited to announce the arrival of Ameya, our new family member! He arrived two weeks ago, and needless to say we've been operating on little sleep since then. Keep watching this space for more pictures, and I promise to be back soon.